Torrentés Emerges from Malbec’s Shadow: In northern Argentina near Salta V, vineyards in Cafayate Valley — which range from from 6,000 to 10,000 feet in elevation — are ideal for growing Torrontés, the country’s signature white wine. From one of the world’s loftiest vineyard regions comes an aromatic, tangy tipple called Torrontés (tor-ohn-TEZ) wine. It’s known as Argentina’s signature white and the Cafayete Valley in far northwest Salta province—ranging from 6,000-10,000 feet in elevation—is the source of some of the best Torrontés grapes. 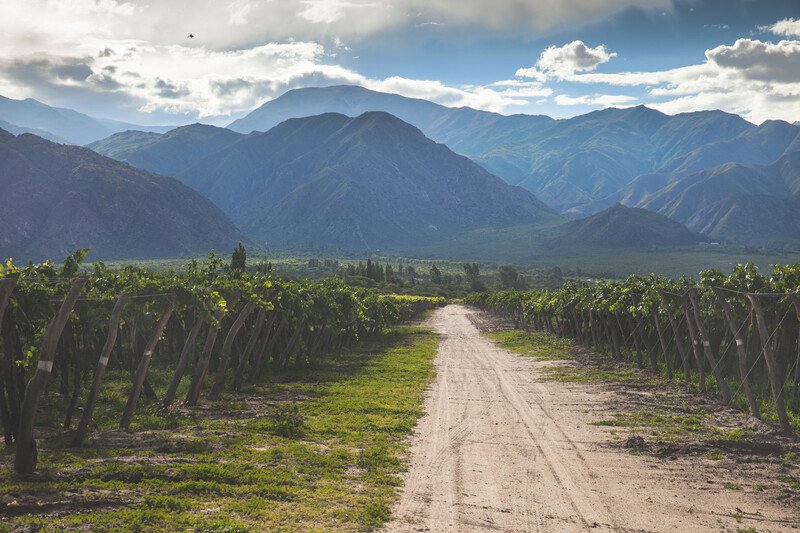 Farther south, the variety is also widely planted in and around Mendoza, a place already familiar to many Americans. 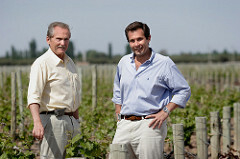 Alberto Arizu Sr., left, and Alberto Arizu Jr. at Luigi Bosca in Mendoza, Argentina. But it has been a jagged ascent. In the last decade sales were buffeted by difficult economic conditions in Argentina and adverse exchange rates. This led to a see-saw in sales: Exports of Torrontés to the U.S. swung from 45,000 cases in 2005 to a high of 268,000 cases in 2011, followed by a steep downturn to 115,000 cases in 2014. Sales, now, are on the upswing, rising 3.5% to 119,000 cases in 2015, reports Magdelena Pecse, Director of Marketing and Communications, Wines of Argentina. “Torrontés is great for the summertime,” asserts Brian Bowman, Beverage Director, Sun Singer Wine & Spirits in Champaign-Urbana, IL. “Around Mother’s Day, we’ll do a tasting of four-to-six wines, including a Torrontés, to build sales.” He notes the store currently carries three Torrontés: Trivento Amado Sur at $13.99, Le Madrid at $14.99 and Ernesto Catena Padrillos at $10.99. At Century Liquor & Wines, Manager Jim Verhey notes, “Our Torrontés sales are consumer-driven.” He, too, advocates in-store sampling. Century currently sells Molinos Torrontés for $6 a bottle, as part of the store’s half-dozen wines featured at that bargain price; Molinos is also sold online via a dedicated $6 tab on the store’s homepage. 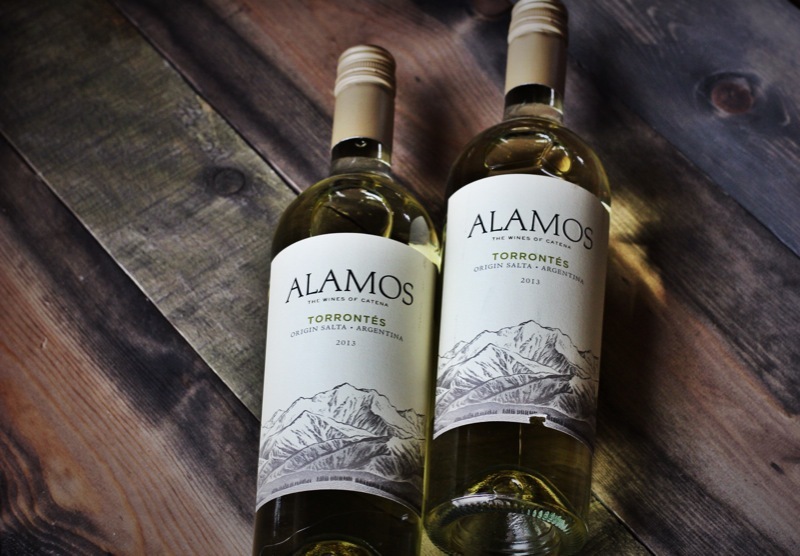 Century also stocks Torrontés wines from Alamos, Crios and Michel Torino. 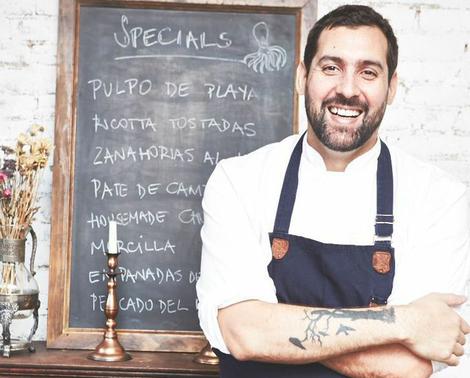 Argentine Chef Fernando Navas of Ballerina Restaurant in New York City. Noting the strong food association for Torrontés, at Tower Wine in Atlanta, Wine Manager John O’Brien comments, “Most of our Torrontés sales come from customers whose friends served the wine at a dinner party or had it a restaurant.” Tower currently offers Torrontés wines from Alamos, Crios and Colomé, each for under $15. The author wishes to thank Beverage Media to publish this article, which appears in the June 2016 issue of the magazine. This entry was posted in Argentina, Torrontes and tagged Argentina, Argentina Wines, Torrontes. Bookmark the permalink.